Welcome to the Crimson Sea a whole sea region you can easily plug in your ongoing sea campaign. One of the most infamous sea sections of the world, the Crimson Sea, owes perhaps its name to the vast amount of blood spilled in its water. This relatively small sea features many dangers such as pirate islands, a maelstrom, a mysterious island, kraken caves, a sunken city, smugglers' hidden ports, a mermaids island, a ghost ship, ships graveyard and more. Obviously, not every inch of this sea is detailed in this product, instead we mapped out the most interesting locations. This Boxed Set contains nine Blueprints plus a color map folio. 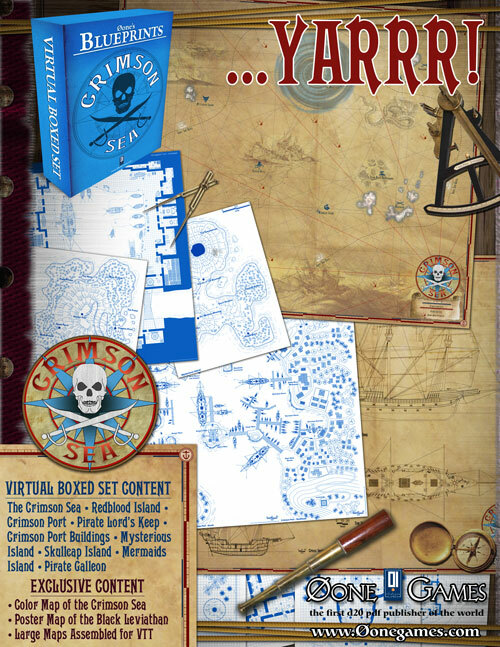 The color map folio contains a color version of the Crimson Sea Map plus a poster map of the Black Leviathan, the Galleon of the pirate lord Karnak. Extra files contain all the large maps (those with more than 2 sheets to assemble) already joined for using with VTT. Let’ see in detail what we have in this Virtual Boxed Set©. An overview map of the Crimson Sea complete with direction lines, marine scale and terrestrial scale. You will find maps of the various levels of an ancient, abandoned fort, a devastated temple and the island itself. An overview of the most infamous port of the Crimson Sea. This blueprint details some of the most relevant buildings of the pirate port: The Inn of Skulls and Cannons, The shipyard, The Church of the Seven Sea Gods andThe Sperm Whale Warehouse. Floorplans of the Pirate Lord's Keep standing in the middle of Crimson Port. This volcanic island is the home of the evil Dr. Marteau. It contains the map of the island itself, floorplans of the mansion of Dr. Marteau, a hidden dock and a village of beastmen. This island owes the name to its particular shape. It contains the map of the island itself and a subterranean smuggler's port. By far the smallest island of the Crimson Sea, this is perhaps the most dangerous one. It contains the map of the island itself, floorplans of the temple, floorplans of the old lighthouse, maps of the underground caverns. This is the standard fast and well-armed galleon used by most of the pirates of the Crimson Sea.